One of the most beautiful things about art is the merging of different elements; the constant need to find new ways to express ourselves is what results in fresh and interesting works of art. Contemporary art has seen some of the most thrilling, exciting new forms of expression; from using technology as a form of art, to creating futuristic architecture, that we may have previously only imagined to be real in the world of cinema. We decided to look further into ‘nature meets art’ by identifying and celebrating architecture with aquatic qualities and components. Some of the most famous architects have used aquatic elements in their work as this creates a sense of flowing in their designs; whether it is the physical, literal merging of water and architecture, or simply the feeling of an aquatic notion that appears within the projects, the idea of merging elements is what creates these beautiful, iconic pieces of art. We decided to look at the top four houses with aquatic qualities, in order to celebrate this incredible artistic direction. 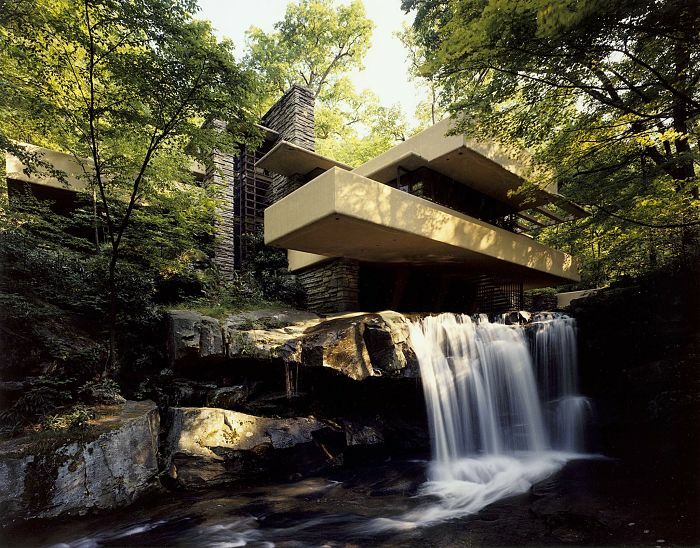 ‘Falling Water’ or otherwise known as ‘Kaufmann Residence’ is a home that was designed by the famous architect, Frank Lloyd Wright in 1935. It is located in South-Western Pennsylvania, and is now considered an historic landmark. It is the combination of nature and architecture that makes this home so beautiful, as the water and nature have intertwined with the home. It appears as if the home is built on top of a waterfall, which creates the idea of merging elements. The house appears to be slightly hidden behind it’s green backdrops, whilst Frank Lloyd Wright has used the aquatic element in an exciting way, making it part of the house rather than just something that just surrounds it. The waterfall is flowing from underneath the house, but continues into a stream, which makes it appear as if the house is actually part of it the waterfall. The flowing water continues from the bottom of the home into the water fall and rocks that are natural, rather than man made, which is perhaps where the name ‘Falling Water’ comes from. The stone, brick effect, which resembles the rocky waterfall that is underneath and surrounding this home, shows the two elements that are coming together, making the home appear as a product of nature rather than architecture. This historic home also inspired the famously appreciated house in Alfred Hitchcock’s ‘North by North West’ which was made to directly resemble this masterpiece. Once again we see the combination of architecture and water in the incredible but humble ‘Water Nest’ by Giancarlo Zema. Although the two elements have also been combined here, we can see it in a different light. This architectural beauty is created for EcoFloLife, a company aimed at designing luxurious yet eco friendly ‘floating’ homes. The homes are designed so that they can be located anywhere with ‘calm’ bodies of water, reinforcing the Zen experience of the water nest. They are also entirely powered by the sun, which is why they are so widely appreciated, not only for their aesthetics but environmentally friendly purposes. 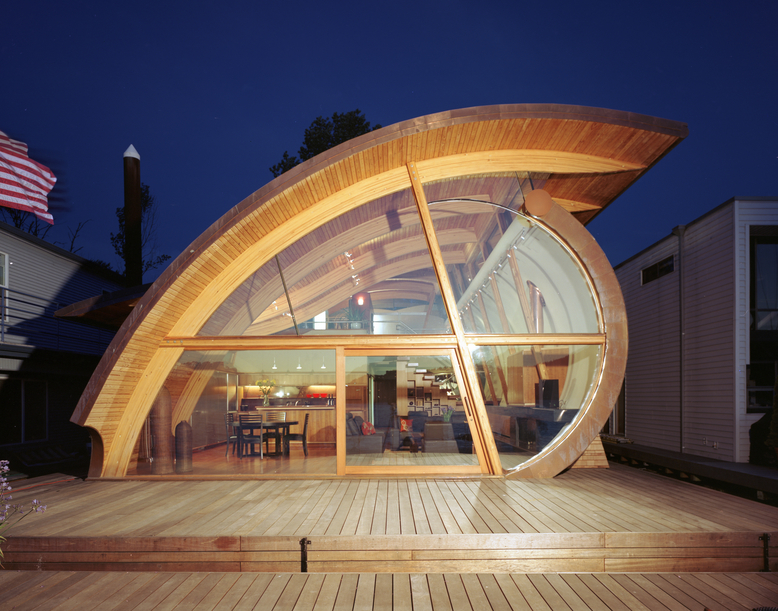 These homes are designed with large shapes, both on the exterior and interior. The purpose of using larger, round shapes is so that the homes are seen as more simple and relaxing, rather than using harsh edges in the furniture or design of the homes. Most certainly these homes are an extraordinary example of modern architecture, not only are they a combination of natural elements, but they attempt to bring this into the foundation of the homes; using 98% recyclable materials in order to truly capture the essence of nature meets architecture, with an environmentally positive motive. 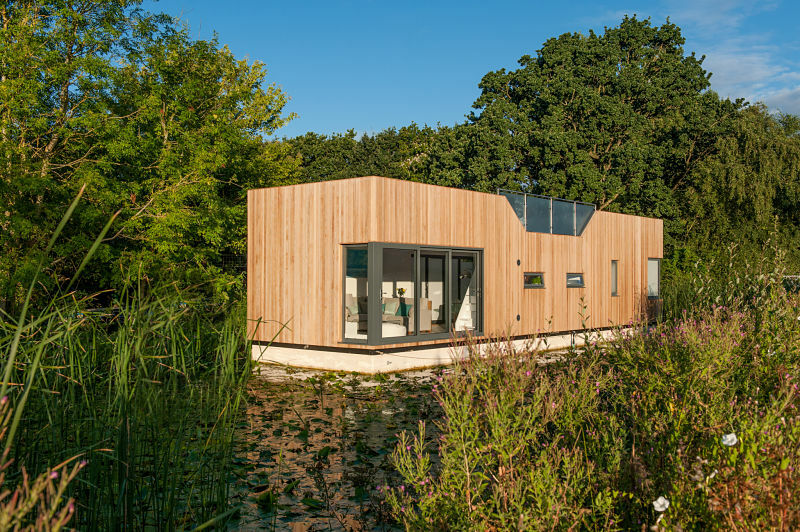 The first ever amphibious home in the UK, created by Baca Architects, is a masterpiece of natural elements that contrast with the modern architecture that we all know; with the overgrowing greenery that almost consumes the home and surrounding lake. Although this is a prototype, it is an example of homes that will incorporate water and nature in the future, because of the environmentally friendly benefit this will have. 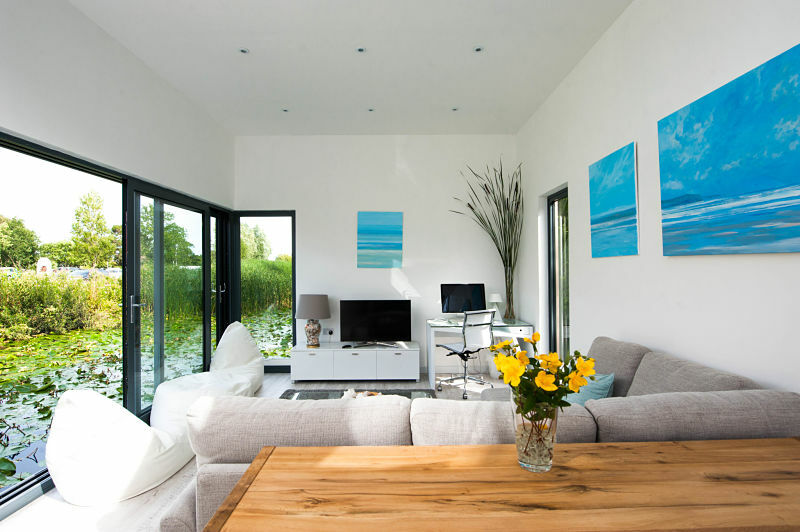 The floating home designs were created in order to tackle housing problems, they were seen as a way of using all space including natural elements. The inspiration for these designs were drawn up from canal boats, that are known for their space efficiency and the peaceful element of effectively living on water rather than land. The designers attempted to create the illusion of a spacious environment by using light colours, and larger windows, keeping the space open and light. The ‘shock absorber’ installed at the bottom of the home is what prevents the water from causing any movement, which is what keeps this homes atmosphere so calming and zen. The beauty that radiates from this home simply cannot be captured by photograph. The intricate detailing of the home is what makes it so interesting and monumental with its swirling design, so close to the water, it almost mimics the notion of waves and has aquatic qualities within its shape as well as its location. The house is on the Willamette River in Portland Oregon, and is designed with larger windows, so that the majority of light can reach the interior of the residence. The interior is very compact and therefore needs the light to make it appear more spacious and open; the open large windows also give a beautiful view on the river and creates the aquatic element of architecture that we all love. The open space and large windows allows the sun to consume the interior and exterior of the home, which is what makes this home so exciting to live in, almost resembling the beach houses we all dream of. The materials and colours used within the interior is what gives it comfort and warmth, whilst the notion of being on water, rather than near it, is what gives it the peaceful, calming element. 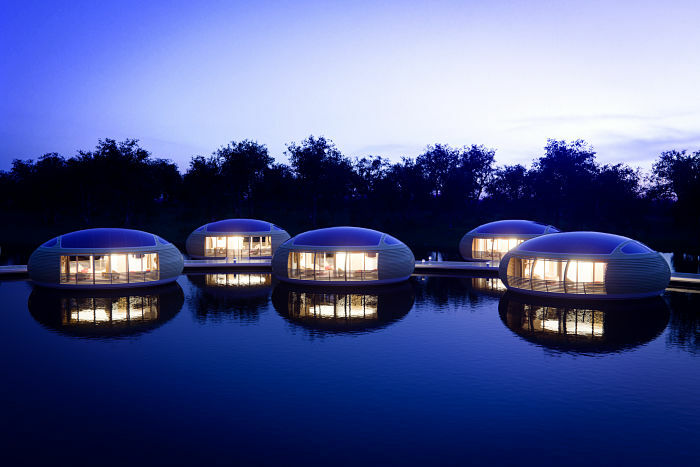 ‘Floating homes’ are not a new concept, but the need for them has perhaps been more urgent in recent years. They historically began as a way of tackling housing issues, being more space efficient, and living a minimalistic life. They are an attempt to use beautiful modern architecture, and merge it with water and aquatic, peaceful qualities. They are minimalistic, eco friendly, and of course we must appreciate how exciting they are to look at.